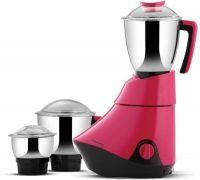 This Mixer Grinder comes with 3 speed knob with whip and poly-carbonate Lid for all 3 jars. It has aesthetically designed body with 3 stainless steel jars. To Recieve updates and possible rewards for Butterfly Splendid 3 Jar please sign in. To Recieve updates and possible rewards for Juicer Mixer Grinder (JMG) please sign in.